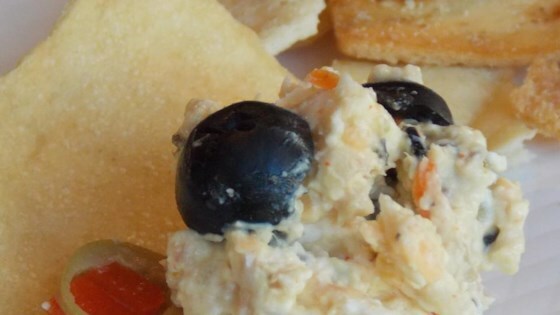 "This is a great dip made with ham, cream cheese and shredded Colby cheese. Olives, mustard and cayenne pepper make it zesty and unforgettable." In a medium bowl, stir together the cream cheese, deviled ham spread, shredded cheese, green olives, mustard, and black olives. Season with mustard powder, celery salt, cayenne pepper and garlic salt. Mix well, then cover and refrigerate at least 15 minutes before serving. Served at a party and it wasnt well received. We didn't like it much at all. This is the best dip. I get requests to make this dip all the time. LOVE IT! Was looking forward to trying this recipe. However, flavor was not my favorite. Would recommend as others to cut amount in half.